I believe firing squads are fast, effective and humane. Lethal injections have been botched lately. It's hard to botch a firing squad; assuming you use enough marksmen art a short range. Ray argues that a team of trained marksmen is faster and more humane than the drawn-out deaths that have occurred in botched lethal injections. His bill would call for a firing squad if Utah cannot get lethal injection drugs 30 days before an execution. 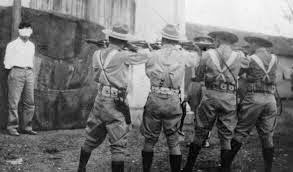 Critics say the firing squad is a gruesome relic of Utah’s Wild West past and would bring international condemnation upon the state. That criticism and excessive media attention was one of the reasons many lawmakers voted in 2004 to stop allowing condemned prisoners to choose death by firing squad.